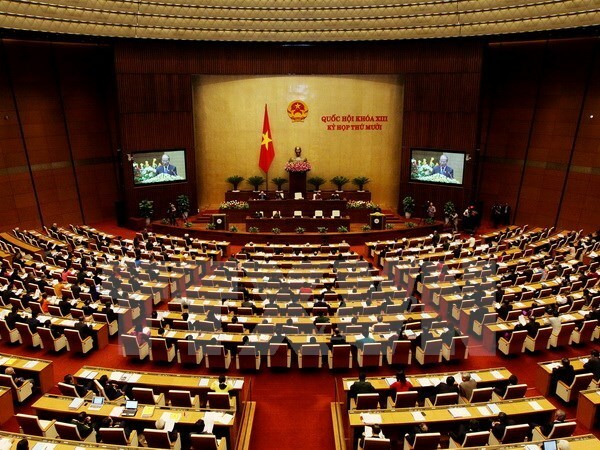 Hanoi (VNA) – The 10th session of the 13th National Assembly concluded on November 27 after more than one month of sitting, with 16 laws and several resolution adopted and 10 draft laws scrutinised. Deputies approved the resolution on the establishment of the National Electoral Council, elected the council’s Chairperson and adopted the lists of the council’s Deputy Chairpersons and members. They also elected the Secretary General of the 13th National Assembly. A resolution on the 2016 socio-economic development scheme was also passed at this session, outlining the overall targets of economic stability, higher economic growth, growth quality improvement and sustainable development. A new feature of the session was the unprecedented question-and-answer session with the presence of all Government members to respond to deputies’ queries regarding their remit. Speaking at the closing ceremony, NA Chairman Nguyen Sinh Hung lauded positive progress in 2015’s socio-economic situation, with major targets set under the National Assembly’s resolution reached. He also pointed to existing shortcomings and weaknesses, which need to be addressed. The quality, efficiency, competitiveness and international integration capacity of the economy remained weak, agricultural production faced difficulties, overspending was high, public debt increased and economic restructuring was slow. Administrative reforms and the fight against corruption failed to meet expectations, social order and safety showed complicated issues, and the task of protecting the national sovereignty over sea and islands faced new challenges.